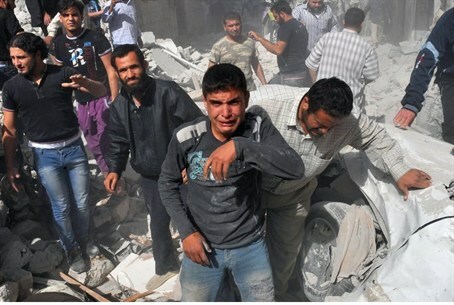 Fighting in Syria continues despite calls for holiday ceasefire; at least 60 dead. Iran blames America, Israel. Fighting has continued in Syria despite calls for a ceasefire during the Eid ul-Adha holiday. At least 60 people were killed in fighting Thursday, rebel leaders report. Iranian leader Ayatollah Ali Khamenei blamed the United States and Israel for the ongoing violence. Khamenei accused the U.S. and Israel of inciting violence between religious groups in Syria in order to weaken the Islamic world. Israeli-Arab MKs voiced similar views Thursday. MKs with the Balad party held a news conference at which they claimed that the violence in Syria is part of a conspiracy against Assad and blamed the U.S. for bloodshed in the country.